↑ 1.0 1.1 1.2 1.3 Halliday, D.; Robert R., Jearl Walker. Fundamental of Physics, 7th Ed. USA: John Wiley and Sons, Inc., 2005. ↑ Reif, F. Understanding Basic Mechanics 2, illustrated. Wiley: pp. 95, 1995. ↑ Beatty, M. F. Principles of engineering mechanics Volume 2 of Principles of Engineering Mechanics: Dynamics-The Analysis of Motion. Springer. 2006: 24. ↑ Lubliner, J. Plasticity Theory (Revised Edition) (PDF). Dover Publications. 2008: pp. 27–28. ↑ Galili, I.; Tseitlin, M. Newton's First Law: Text, Translations, Interpretations and Physics Education. Science & Education. 2003, 12 (1): 45–73. Crowell, Benjamin (2011), Light and Matter (2011, Light and Matter), especially at Section 4.2, Newton's First Law, Section 4.3, Newton's Second Law, and Section 5.1, Newton's Third Law. Feynman, R. P.; Leighton, R. B.; Sands, M. (2005). The Feynman Lectures on Physics. Vol. 1 (第2nd版). Pearson/Addison-Wesley. ISBN 0-8053-9049-9. Fowles, G. R.; Cassiday, G. L. (1999). Analytical Mechanics (第6th版). Saunders College Publishing. ISBN 0-03-022317-2. Likins, Peter W. (1973). Elements of Engineering Mechanics. McGraw-Hill Book Company. ISBN 0-07-037852-5. Marion, Jerry; Thornton, Stephen (1995). Classical Dynamics of Particles and Systems. Harcourt College Publishers. ISBN 0-03-097302-3. NMJ Woodhouse (2003). Special Relativity. London/Berlin: Springer. 第 6頁. ISBN 1-85233-426-6. 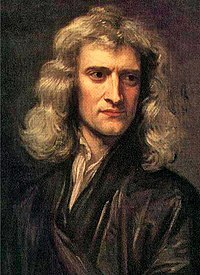 Newton, Isaac, "Mathematical Principles of Natural Philosophy", 1729 English translation based on 3rd Latin edition (1726), volume 1, containing Book 1, especially at the section Axioms or Laws of Motion, starting page 19.